There are many genres of online slots available at the many online casinos but one of the more unusual is those based on Ireland. 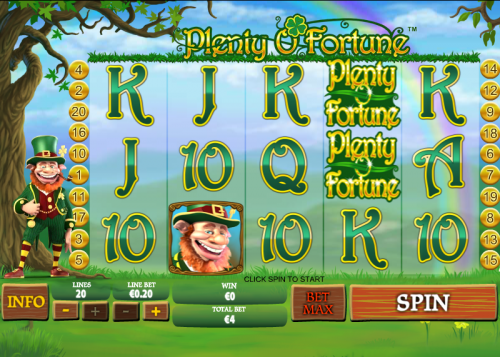 Plenty O’Fortune is Playtech’s version of an Irish-themed game but Leprechaun’s Luck from Ash Gaming and Golden Shamrock from Net Entertainment are remarkably similar. Still that’s no bad thing as long as we end up with a game that’s fun to play. Plenty O’Fortune is a five reel and twenty payline offering which kicks off with an intro movie featuring a ginger-haired leprechaun and some very Celtic pipe music. The background to the reels is a rural setting with our leprechaun to the left of the reels under a tree and a rainbow in the distance. Playing cards and the game’s logo represent the low value symbols but four special symbols make up the remainder so we have a Rainbow wild, a Wishing Well scatter, a Pot of Gold scatter and a Leprechaun bonus. Earn this bonus by landing three or more of the Wishing Well symbols anywhere on the reels; coins will pour out of the wells and a leprechaun will try and collect them in his hat. You can see the total prize counting up at the top of the screen and it’s worth noting that if you trigger the bonus with four wells you’ll win 2x the average prize amount – five wells means 10x the average payout. Land three leprechauns on reels two, three and four and win twelve free spins; bronze, silver and gold coins are added to the reels during free spins and they are worth multipliers of 1x, 2x and 5x the total stake. Trigger this bonus game by landing three, four or five of the Pot of Gold symbols anywhere on the reels; you’ll now be taken to a bonus game consisting of six levels up a path towards the final pot of gold. Pick one pot of gold on each level for a cash prize but once you hit ‘Collect’ that’s the end of the game. Four triggering pots will win 3x the average payout while five pots will 10x the average. So it might be similar to those slots we mentioned earlier but that doesn’t detract from it’s playability; the animations are top notch as are the sound effects and maybe we were lucky but the whole game proved quite lucrative for us. Playtech have done a good job here.